Situated between the Dende Coast and Coast Cocoa, the main nearby cities, Ilheus and Salvador, the Marau Peninsula is an area of environmental protection, has lush flora and fauna of rich biodiversity. 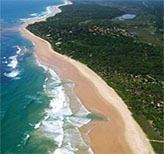 With over 40km of semi deserted beaches, among them Taipu de Fora, considered one of the most beautiful in Brazil. The landscape is completely transformed with the variation of the moon and the tides. You will be able to observe dozens of natural pools that form during low tide, full of fish and marine life that arise in coral reefs. Their nature also includes freshwater lakes, tropical forests and one of the largest areas of Brazil protected by the government of mangroves. Formed by small villages, Barra Grande is the largest of the peninsula and still preserves the simplicity of the local population. By air: there are 5 airlines (TAM , GOL , AZUL , TRIP and AVIANCA ) operating direct flights to the airport of Ilheus from Sao Paulo, Brasilia, Belo Horizonte, Rio de Janeiro and other cities. 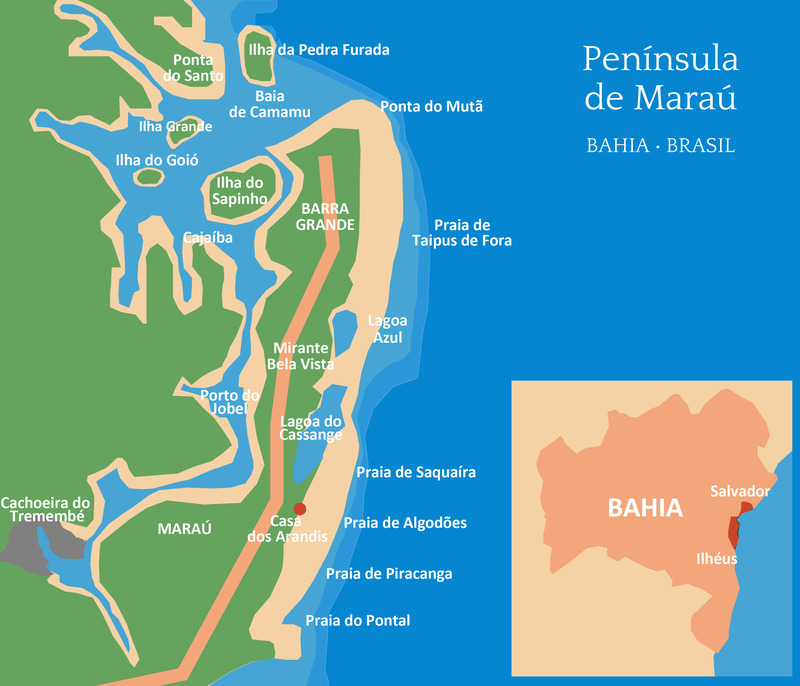 By Land: The House of Arandis is exactly 108 km north of Ilheus, about 1:50 h drive. The hotel offers the free shuttle for guests (price on request ). 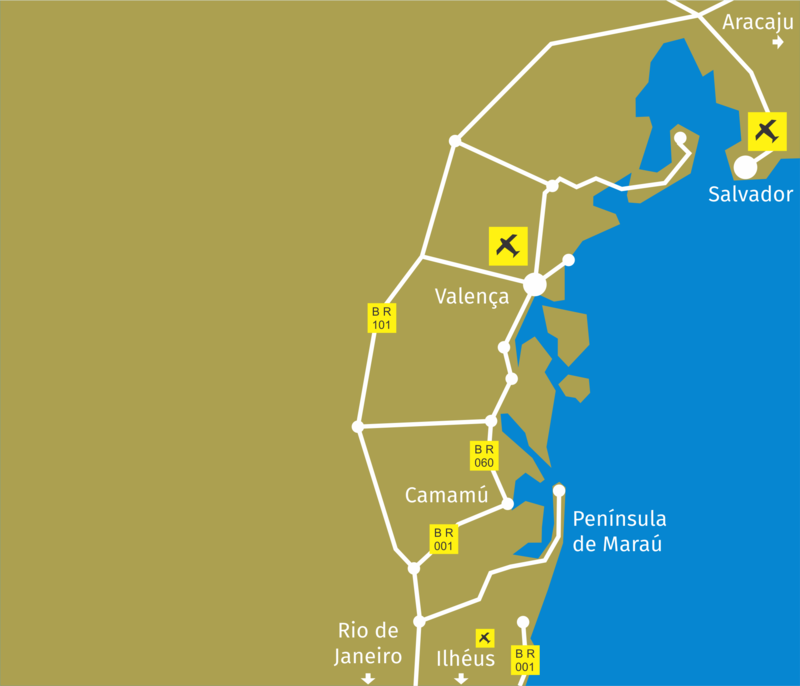 We can indicate car rental companies at Ilheus Airport as a transport option and should be contracted in advance. 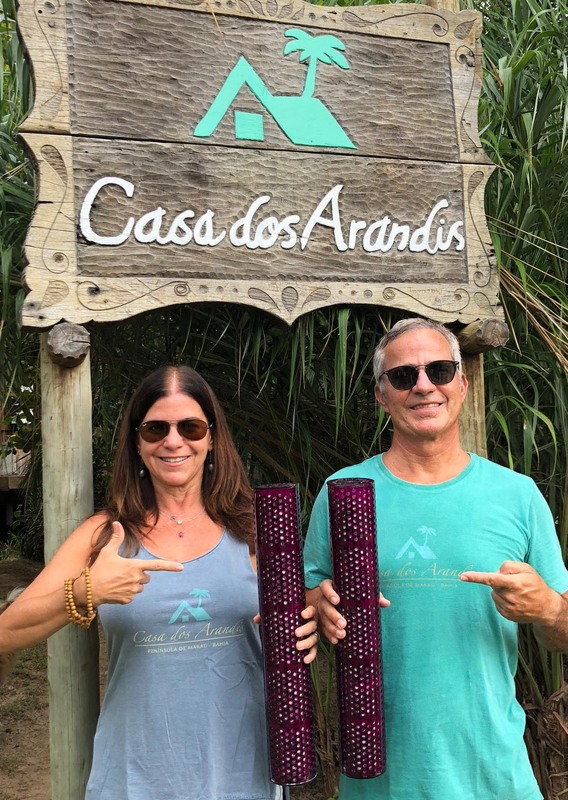 The Casa dos Arandis search interact with nature in a responsible and sustainable manner, respecting, accepting the culture of the region and providing benefits to the local community, supporting social projects. Practice a less invasive tourism enabling customers know the site without plunders it and enjoy all surprises that Mother Nature has in store. The Casa dos Arandis supports the Rede de Agroecologia Povos da Mata (Agroecology Network of Forest Peoples). Created with the objective of organizing production of family farming and traditional communities (indigenous and Maroons ) in southern Bahia . Through the organization and training of production, harvest healthy food and agro-ecological (environmental, social and economic - fair price ) . It can strengthen local marketing through agroecology fairs in cities, universities , condominiums , delivery baskets and public policy programs. 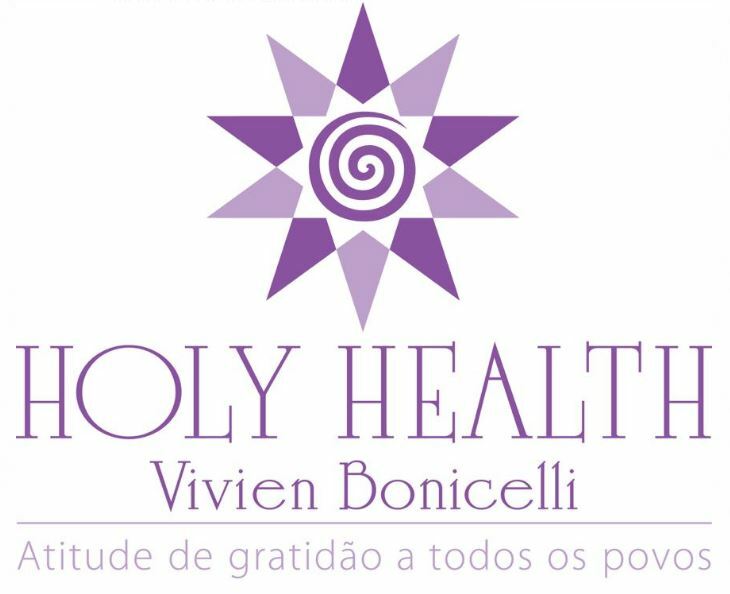 Casa dos Arandis is pleased to announce the beginning of the partnership with Holy Health by Vivien Bonicelli through the innovative nanotechnology of HHVB products for treatment, purification and multi mineralization of its waters. "As the molecular structure of water is the essence of all life, the man who can control this structure within cellular systems will change the world". Dr. Albert Von Szent-Györgi Nagirapolt - Nobel Prize Physiology of Medicine 1937. "If we renew this fluid at regular intervals, giving the cell the nutrition it needs, as far as we know, the pulse of life can go on forever". Dr. Alexis Carrell - Nobel Prize Physiology of Medicine 1912. Holy Health works on solving, recovering and transforming global problems. 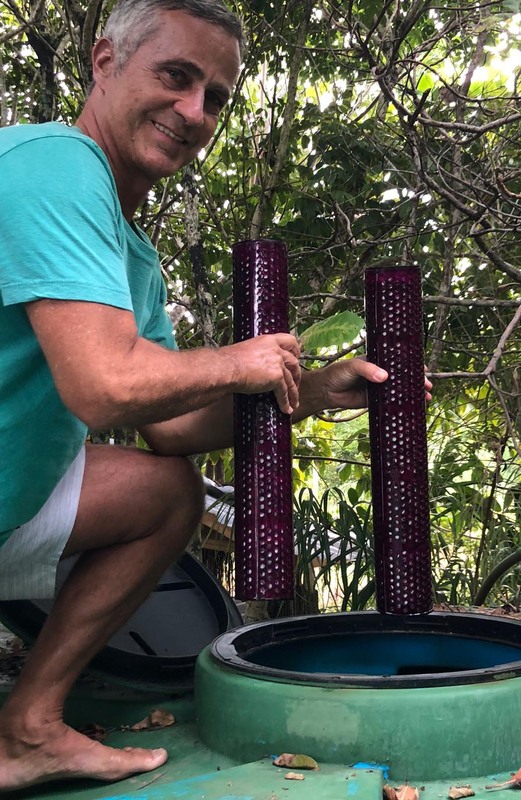 Inspired by the above theses, it puts them into practice by creating and developing technologies and products that purify water and liquids in a unique way, with important results, proven nationally and internationally. Developed by scientist Vivien Bonicelli, HHVB technology is 100% Brazilian, and does not use chemicals and pollutants. The application of HHVB products promotes decontamination, decontamination, reduction of metals, and at the same time multi mineralizes, allowing the water to recover its original characteristics, becoming extremely light, moisturizing and nourishing in its fullness! It can be applied in small and large scale, making customized projects according to the characteristics and needs of each case. Acting not only in cleaning, decontamination and purification of liquids in general (because all contain water), but also in crops, plantations, etc. It has about 100 products developed, offering relevant solutions that restore environments with critical scenarios, turning them into healthy environments.